The first thing to notice about Cafe Bobuska is the central location: just by Nørreport st., the busiest st. in Denmark, with connection to most places. We at Bobuska are expert facilitators of all kinds of events. We have 2 rooms and a tea cave that can be booked for private parties, meetings, screenings or performances. We focus on creating a beautiful atmosphere, through lighting, music and whatever else your heart desires. We have a fully-stocked bar and are happy to create a bespoke drinks menu or order in your favourite ales’n’pilsners for the event. We have a unique room behind the bar which is a dark and cosy lounge area, complete with mood lighting, massive speakers and projector should you wish to get spacey. We have a stage and all the gear required for a live performance (PA, monitors, lighting, microphones). Furniture can be rearranged as you wish to accommodate some hot moves on the dance floor. In addition we have a projector & screen for screenings which can be set up in the cave or on the stage. We have an extensive network of musicians and other artists. If you would like to hear some live music at your event, for example a reception pianist, or some acoustic music of any genre. We are able to prepare snack plates, canapés, soups or delicious Korean food from our neighbours next door at KOPAN (www.kopan.dk). Give us a call to discuss in detail. Do you need an event photographer, face-painting, exotic dancers? Let us know and we will work it out, we are an open-minded bunch. We are a small cafe just by Nørreport st. between Torvehallerne and Botanisk Have. We are an informal and cosy place, we can host up to 50 people at receptions / product launches/ etc. The seated capacity is limited, but for an intimate group more formal seating is possible. 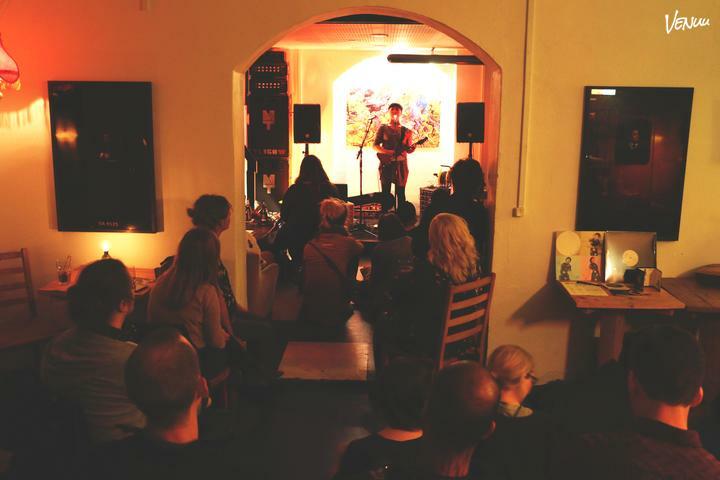 We have a small stage with all stage equipment and a cosy tea cave where coffee and avec can be enjoyed. We have an extensive network of musicians and other artists. If you would like to hear some live music at your event, for example a reception pianist, or some acoustic artist of any genre. Do you need an event photographer, face-painting, exotic dancers? Let us know and we will work it out. The price depends on many things, like number of guests, event duration, use of facilities and any special add-ons like food or a reception pianist. To give you an idea, you can book 1 room for up to 5 hours with bartenders for 1900kr. OR you could book up the entire space for up to 7 hours and 40 guests for 3900kr. You can cancel up to 2 weeks in advance. If you cancel later than that and up to 2 days prior to event, half of the rent will be charged. If you cancel later than 2 days prior, full amount will be charged. I have held several book releases at Bobuska and it’s perfect for all kinds of releases. They have all the right music equipment, reasonable prices on beverages and are very helpful and kind. My warmest recommendations! I had my birthday here. I got to have my dream celebration: a salon reception, complete with a pianist playing beautiful dreamy music, a huge table of delicious canapés, cava and smiling faces. It was like stepping into an old novel: everything exquisite and cosy.